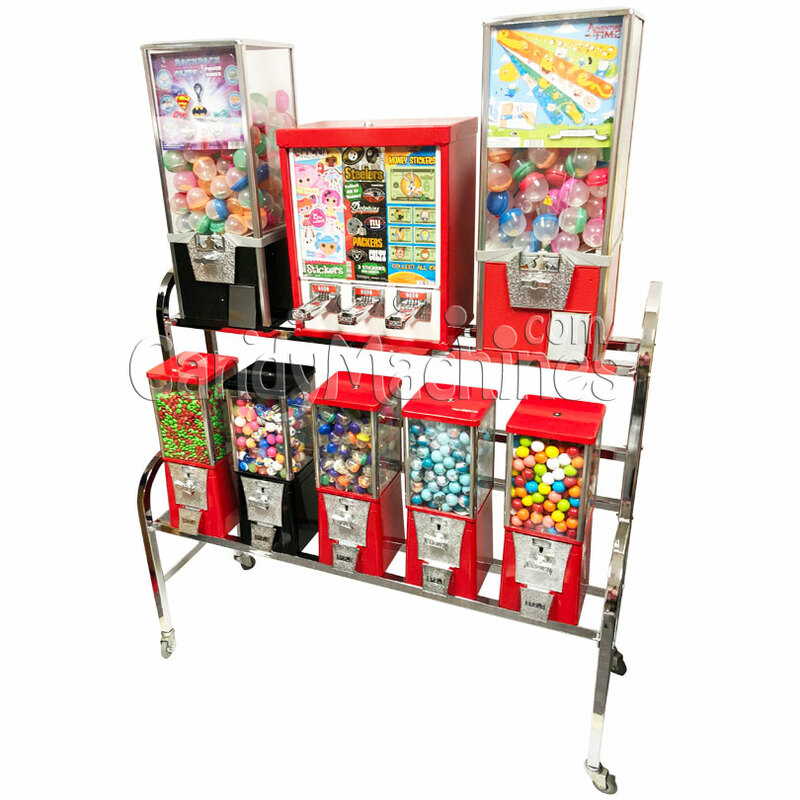 This rack includes five Eagle Bulk Vending Heads, two Rhino 25 inch Toy Vending Machine, one Eagle 3 Column Sticker and Tatto Vending Machine (RED ONLY) and one 45 inch bulk vending rack (BLACK). Features five of our The Eagle Bulk Vending Machine (Eagle Cabinet Vending Machine) with two Rhino 2 inch toy vending machine, a 3 column sticker and tattoo machine and a black 45 inch bulk vending rack. This setup is available in red baron and midnight black for all machines except the Sticker Tattoo machine. The sticker tattoo machine is only available in Red. The Eagle Cabinet bulk vendor is one of the few machines on the market featuring a tough metal body. Eagle Bulk Vending Machines are pre-set to a 25 cent vend which will also accept the Canadian quarter or have the option to upgrade to a 50 cent, 75 cent, $1.00 (4 quarters), and .984 token mechanisms. The Rhino Toy Vendor is pre-set to accept 50 cents and has the option to be 75 cents, $1.00 (4 quarter), or .984 Token mechanisms. 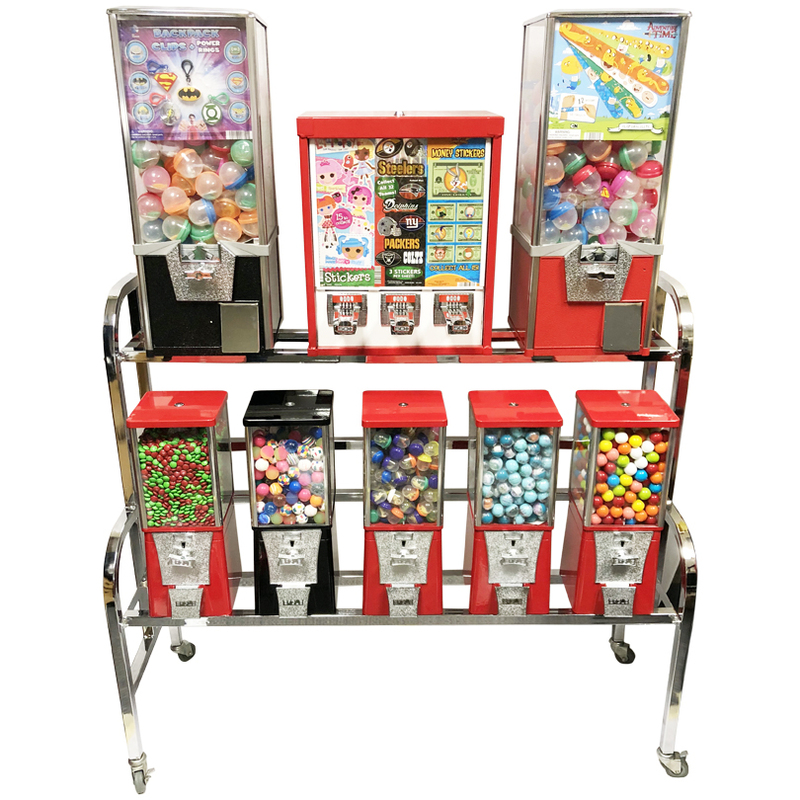 Each Eagle Cabinet Vendor will hold about 10-12 lbs of small candy and 360 1-inch gumballs or toy capsules/bouncy balls. The width of the fully assembled rack is about 45 inches. Eagle Vending Machines are backed up by an industry leading factory warranty. Holds approximately 750 stickers or tattoos, which would be 250 per column. Eagle Vending Machines for Sale at wholesale prices! 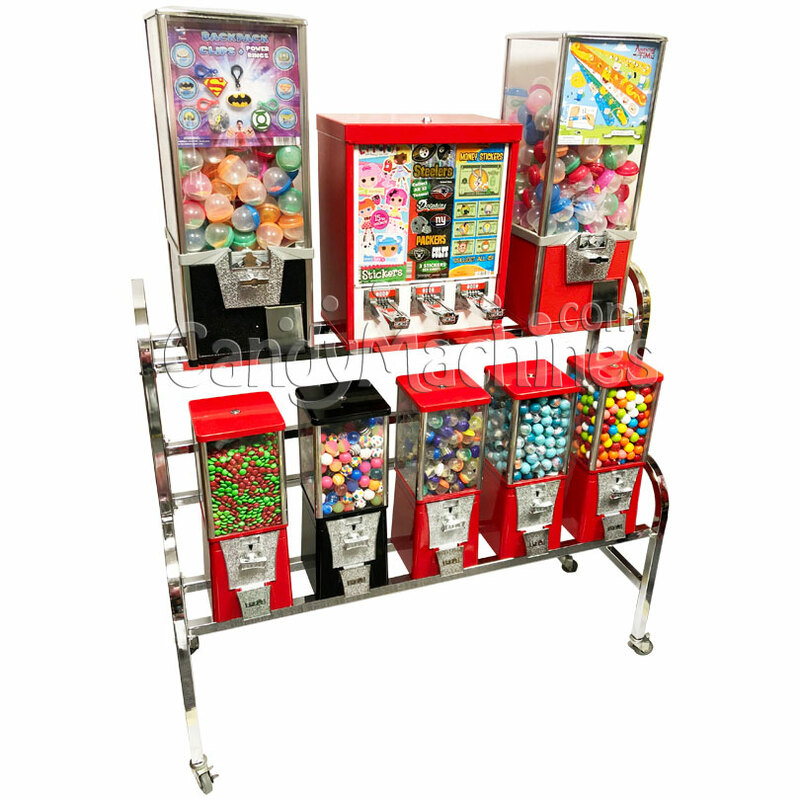 CandyMachines.com is proud to be the exclusive authorized online distributor of Eagle Vending Machines. The Eagle EMC Vending Machine Company has been one of the true work horses within the vending industry for many years. The Eagle Vending Machines have the same classic look and are made of the same quality parts that Eagle Vending Machines have always been known for. We combine Eagle Cabinet Vending Heads and Eagle Sticker and Tattoo Machine with our universal racks and heavy duty stands, allowing you to pick any rack or vending configuration to fit your needs. Looking for an alternative to your Oak Vista bulk vending machines? See our full line of Eagle Vending Machines.